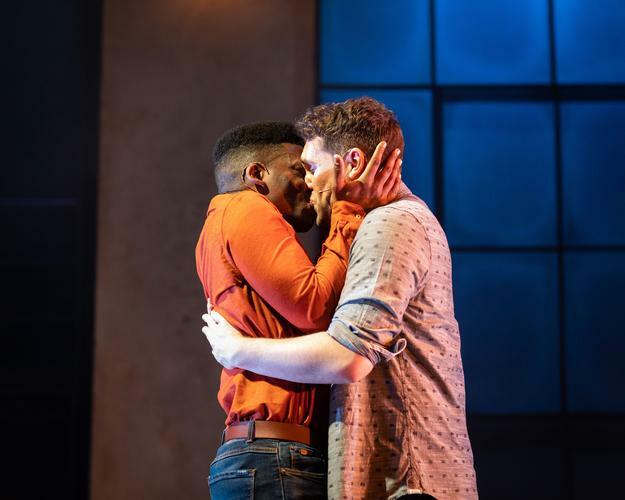 Despite the title sounding as a Brexit reminder, Leave to remain, written by Matt Jones and directed by Robby Graham, is a love story set in modern London, between Obi (a brilliant Tyrone Huntley) and Alex (Billy Cullum). Within the first three minutes, we see the entirety of the first ten months of their relationship, in a rapid and beautifully choreographed sequence of scenes. They meet, dance, go to the museum, move in together in a beautiful flat in Shoreditch. Alex is an American whose firm is planning to relocate. Hence, he needs a Visa. Shall we get married, Obi? It is clear that this wedding will bring some complications, especially when Obi’s family will meet Alex’s one. Cornell S John is Obi’s conservative Nigerian father, who is proud about his son’s career, but blames the society for destroying Obi; his son’s sexuality cannot be accepted, it would be shameful for the family. Luckily, Obi has the warm support of his sister Chichi (Aretha Ayeh). Obi’s mother (Rakie Ayola) goes through an emotional journey, showing that, no matter what, a mother will always love her son. There are some problems in Alex’s family too. His parents' (Johanne Murdock and Martin Fisher) marriage is going through a difficult time and Alex has to deal with his overprotective mother, more than before and – as if this was not enough – with his drug addiction. Kele Okereke’s choice of using EDM (electronic dance music) for a musical is surely original, even though at times the lyrics are a bit repetitive. Leave to Remain is a new, fun, fresh, physical, uplifting, different and yet necessary piece of theatre reflecting the issues that still face the LGBTQ+ community in the UK today. It delivers an important message. Catch it while you can.